Question: Is this another doom and gloom prophecy book? Author: Absolutely not! In fact, the scriptures used in my book (not just the author's opinions) reveal a time of unity and peace (from a common faith in a true Messiah) coming to the Middle East. What if earth's destiny was not to end "any-minute" as so many teach, but the unfolding plan of God...and redemption for billions more of His creation...was yet to be fulfilled...perhaps for centuries? Question: Does the book introduce more speculative "Bible Code" theories? Author: No, it restores an ancient method of Biblical interpretation used by both Jews and Christians (as well as in Arab lands), with startling evidence of accuracy and reliabilty from some of history's greatest theologians, as well as preeminent scientific and mathematical minds. This method, called Gematria (counting the numeric value of Hebrew or Greek words) clearly identifies the name and nature of the Messiah and confirms with certainty the divine authorship of the Bible. Question: Is the book aimed at skeptics or believers?...of which faiths? Author: All of the above! I compare the major three religions; Judaism, Islam and Christianity at their core beliefs regarding the Messiah and the significance of the nation of Israel. Following 9/11, the world has been looking for answers, both people of faith as well as the secularists. This book answers with ABSOLUTES, not opinions from "political correctness" or humanistic bias. It also challenges religious fundamentalists...of all faiths, including my own evangelical community. Question: Should Christians focus on literal or spiritual Israel? Author: Both! Read 1 Corinthians 15:45-46. This book reveals the historical and Biblical significance of both natural events in Israel's HIStory and the application to current events, with its implications for "spiritual Israel" (the seed of Abraham by Covenant and faith - both Jew and Gentile). 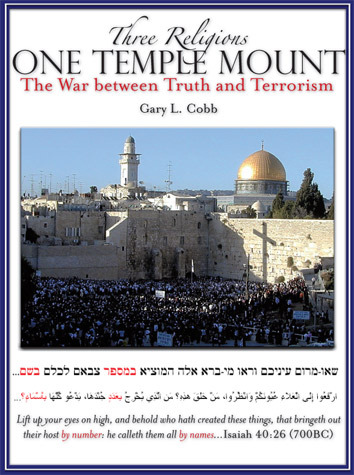 Question: Why the emphasis on the Temple Mount? Author: Because it serves as a microcosm of the entire world conflict. Jews, Muslims and Christians all guard it's significance...both historically and prophetically. However, my book reveals it's true significance as a template, or pattern, to enter the presence of the one true God...and to know with certainty His name...and the "number of His name." Question: Do I have to understand Hebrew or Greek, or use a computer? Author: I am taking my first course now in Hebrew. However, I was able to use a Strong's Concordance and a simple translation table to convert Hebrew and Greek letters to their dual use as numeric values to arrive at my proofs of the Messiah; veiled within Tanach (Old Testament) prophecies. As for complexity, I am now teaching this to my young grandchildren. As Einstein once said, "When the solution is simple, God is answering." Question: What is the meaning and significance of the numbers 666 and 888? Author: My book offers an alternative to the common evangelical view of a single world deceiver (666, the so called anti-Christ). My conclusions on this theology will surprise many religious readers...and, I hope, challenge them. As for 888, the number 8 has long been seen as a symbol of "new beginnings." Even it's shape (infinity symbol when laid on it's side) carries a message. When found as a seal (or signet) in over 100 strategic places in scripture, it becomes so much more. The best way I can explain this is by paraphrasing the Apostle Paul (Philippians 1:21), and proclaim with absolute conviction that; "to live is 888"! Still have questions? Please contact the author anytime! I pray that you enjoy my book...my first. My next book titled "The Last Seal of the King" is planned for release in 2015. It will highlight the progessive revelation of the Kingdom of God. Throughout HIStory, there were "set times to favor Zion"...both ethnic and spiritual.